This was a joint effort between Anthony Viviano, Ajay Revels and Ha Phan. Anthony and Ajay work at a large financial institution and are trying to apply Lean UX within their enterprise. Ha works at a startup called Porch. So, why a manifesto? Anthony, Ajay and Ha were inspired by the Agile Manifesto. Anthony stated that it is simple and to the point. It’s not a list of rules, but a value statement that can be used to guide you through a project or an organizational change. It’s tempting to lay down rules. As if to say, “this list of methods are required to practice Lean UX. Check these boxes in your process and you can brand this a Lean UX project.” We don’t like rules. We prefer principles that drive the methods needed. Lean UX applies well to uncertainty, but not everything is uncertain. You may know your customer, so you can breeze through customer development. Or, you may already have a design, so a design studio is not needed.In addition to their anti-rules stance, there’s another reason why a manifesto makes sense. Anthony heard a few practitioners say that only a startup can apply this process in its purest form. While that might be true, enterprise entrepreneurs (a.k.a. intraprenuers) shouldn’t be excluded from this great thinking. We can take advantage of it by doing what we can to customize it to our unique culture and structure. Anthony, Ajay and Ha hope you allow these values to guide you through your Lean UX journey. Let’s take each of these in turn and see how we can follow the principles of lean UX. What if you worked at a company where usability testing just wasn’t done? Unfortunately, this is the sad state in which many of our fellow UX practitioners find themselves. How, then, do they follow the principles of lean UX? With usability testing, we seek customer validation or early failure. Customer validation may be sought through other means as well. For example, does your company gather feedback from users? If that feedback is circulated, are you on the list of people who receive it? Their focus is on helping customers overcome experience issues. Try to speak to them regularly. They are likely documenting their calls, so see whether you can create some system for tagging experience issues that you can follow up on. This is another group that is focused on the customer. They will understand what customer problems are out there to be solved. They’ll also know which features are important and which innovations customers want. This is an invaluable source of customer desires. Search data can uncover website navigation problems and features or problems that customers are looking for. When you’re handed a requirements document, a thought-out solution, a feature, a brief or whatever artifact you receive to inform your work, begin by asking, “What problem are we trying to solve?” Ideally, you should clearly understand the customer’s problem. Design is problem-solving, so if you don’t know the problem, you can’t design a solution. If you do this enough, then the stakeholders will understand that you’re more than just a wireframe jockey. You’re a professional problem-solver with a system for creating solutions that make sense. Users come to the website from various channels. Users enjoy their first visit (a “happy” user experience). Users come back, visiting multiple times. Users like the product enough to refer others. Users conduct some monetization behavior. Everything else should be applied as it makes sense. For example, if more customer development is needed, then take the time to interview as a team and to internalize customer needs. The lean startup world has no shortage of tools. Use only the ones that make sense to your project and that get you to a validated solution faster. The goal is to release a product. Once it’s released, users won’t interact with the wireframes or requirements document as part of the product. They will interact with the product itself. So, try to spend less time on your design artifacts. How can you lighten your wireframes? Anthony found that if I take the time to present my unfinished wireframes to stakeholders, He would get valuable feedback sooner and save time. If developers, quality assurance testers and business analysts are involved in the design, then they will share ownership and internalize the annotations. When this happens, you can pass off sketches as wireframes because team members will already understand the interactions. These serve a dual purpose. They get you to design validation (i.e. usability testing) sooner, but they also demonstrate the interactions. No need to write detailed wire annotations if the user can see the interactions firsthand. This all boils down to something that I call principle-driven design. 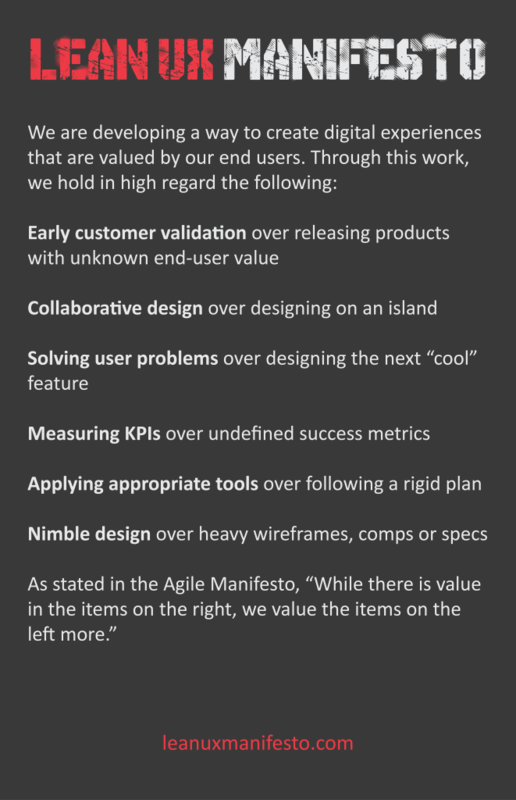 As stated, some lean UX is better than none, so applying these principles as best you can will get you to customer-validated, early-failure solutions more quickly. Rules are for practitioners who don’t really know the value of this process, while principles demand wisdom and maturity. Anthony Viviano, Ajay Revels and Ha Phan, The Lean UX Manifesto, http://www.leanuxmanifesto.com/. Anthony Viviano, The Lean UX Manifesto: Principle-Driven Design, Smashing magazine, January 8, 2014, http://www.smashingmagazine.com/2014/01/08/lean-ux-manifesto-principle-driven-design/.